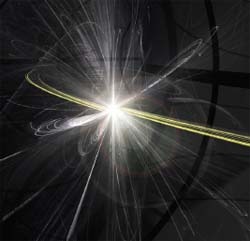 How do scientists search for the Higgs boson? Higgs bosons, compared with many other kinds of subatomic particles, are very hard to detect, in part because they are thought to exist only for extremely short periods of time. To confirm the existence of these elusive particles, scientists use huge particle accelerators to create tiny but extremely energetic subatomic particle collisions. Then, using special detection equipment, they measure the results of thousands upon thousands of these collisions, and examine these huge sets of data to see if there are any subtle signs that Higgs bosons were ever-so-briefly present in them. An artist’s concept of a particle collision being studied at Switzerland’s Large Hadron Collider. By smashing atomic nuclei together at high speeds, in 2012 scientists discovered evidence of the elusive Higgs boson, the particle responsible for giving matter its mass.